I first met Wang Zhi Ping about five years ago in Lao Ban Zhang. The first thing that strikes you is his passion for tea. Befitting his personality, he likes big, bold teas – on a subsequent occasion, in He Kai, he spelled out his disdain for ‘pin pei cha’ – but what makes him interesting is that his family come from Mang Zhi, and his teas also reflect the delicacy of the ‘Liu Da Cha Shan‘. He likes tea from Gedeng, Yi Bang, Jia Bu, etc, teas that are all quite distinctive. Wang Xian Hao was originally set up by his father, Wang Zi Xian, thirty odd years ago in Xiang Ming. Wang Zhi Ping took over the business and moved the shop down to Jinghong with his wife in 2004, but he’s rarely there, preferring to be in the mountains with tea farmers. His wife is the one who shoulders most responsibility for the shop. 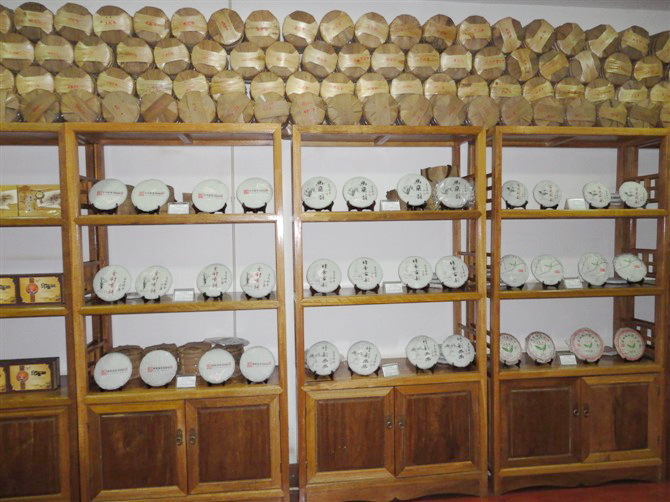 Wang Xian Hao has developed a reputation for high quality, ancient tea tree sheng cha and has customers from Taiwan, Hong Kong and Malaysia.